Avid turkey hunters are always looking for more land to chase after those long-bearded gobblers each spring. Some are fortunate enough to hunt huge farms with plenty of roost trees, dusting areas and strut zones. Others make the most of their grandpa’s 10-acre wheat field out behind the barn. No matter how much ground we have to hunt on, it still seems like the grass is always greener and the turkeys are always bigger, on the other side of the fence. So how do we go about getting permission to hunt those turkey hunting honey holes that we like to call “private land”? How do we sweet talk a landowner into letting us come invade the personal homestead he worked his whole life to acquire? I’m glad you asked! Assure the landowner that you will respect his land as if it were your own. You will always pick up your trash, close his gates, respect his property lines, etc. You may think that doing those kinds of things go without saying, but remember, he doesn’t know you. He may have even had some bad experiences with others who hunted his land in the past. Promising to respect his land can go a long way toward gaining permission to hunt there! Compliment the landowner’s property. Tell him how beautiful his land is and how well he has maintained it. I’m not saying you should brownnose your way onto the land. Be sincere and honest. You chose his land for a reason. Tell him what you like about it and why you would enjoy hunting it. Point out how much you like the spring-fed creek, the rock bluff, the huge cottonwoods (aka roost trees) and the beautiful green fields. Appreciating the same things about his property that he appreciates can go a long way in getting your foot in the door. Offer to work on the landowner’s property in return for hunting privileges. Yeah, you may have to break a little sweat to hunt turkeys this year, but it’s worth it, right? Of course it is! Offering to work tells the landowner that you place value on being able to hunt his land. It shows that you are a hard-working, responsible person; not just some freeloader. Offer to haul off scrap, cut down dead trees, mow his grass, etc. Your labor will be a lot cheaper than buying or leasing land. Offer to give the landowner some of the meat once you have killed a turkey. Like they say, “the way to a man’s heart is through his stomach.” Tell him how good your famous turkey pot pies and turkey chili are. Let him know that you would be happy to bring him some. Giving up a little meat is a small price to pay in exchange for hunting privileges. Take your child with you when you ask permission to hunt. 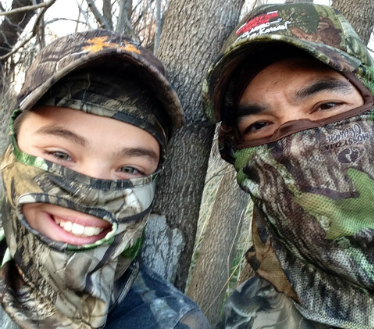 Most people find it hard to resist a young kid asking if they and their dad can hunt on the land. Who can say no to a kid, right? Of course, we don’t do this to be manipulative. Instead, it shows the landowner that you are a family man; not a wild drunkard who is going to trash his property and shoot his cows. Do a little ‘dress rehearsal’ with your kids beforehand to make sure they know to be polite and respectful when talking with the landowner. When you do get permission to hunt, connect with the landowner on a regular basis. Don't just call the night before hunting season. Keep in contact with him about once a month. Ask if there are any projects that you can do for him. Bring him and his family an occasional thank you card, gift, etc. Building a good relationship with him might be what keeps you hunting on the property year after year. Remember that persistence is the key to finding good private land to hunt on. If you get turned down, try another property. If you get turned down again, keep trying. You may be told ‘no’ nine out of ten times. But, you are always only one ‘yes’ away from securing the place to tag your next big tom!